Question: How do I change the firm name for an eservice recipient? If you added the eService Recipient to the case eFileTexas allows you to edit the firm name. If the service contact was added by counsel, eFileTexas does not allow you to edit the firm name but we can get them to do it for you. On the Cases page (Figure 1) find the case in question. 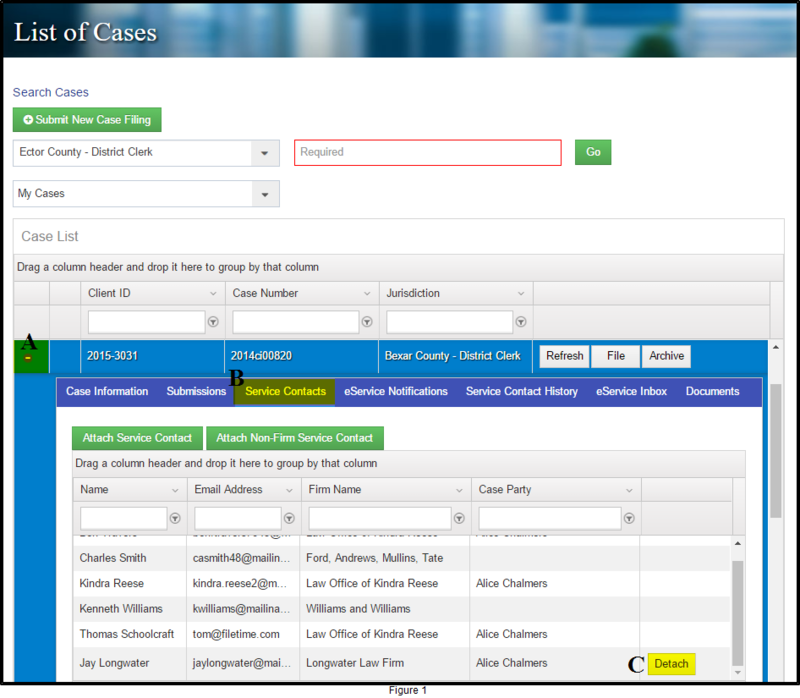 The case tabs open below it – click the Service Contacts tab (Figure 1 B). You will see all the service contacts for this case held by eFileTexas. Look at the service contact in question. If there is no Detach button (Figure 1, C) in the far right column for this service contact you cannot edit that person’s firm affiliation. Contact FileTime Customer Support (support@filetime.com or 800-658-1233) and provide us the name of the person as well as the jurisdiction and cause number and the correct firm name for the person. We will ask eFileTexas to update that person's firm name for you and report back when it has been done. Click the Admin button (Figure 2 A) on the top navigation bar. Click Services (Figure 2, B) on the sub-navigation bar and then Non-Firm Service Contacts (Figure 2, C) on the drop-down menu. Find that person’s name on the list and click on it to highlight it (Figure 2, D). You will then be able to update the firm name (Figure 2, E). Click the Save Changes button (Figure 2, F). If the name is not on the list contact FileTime Customer Support (support@filetime.com or 800-658-1233) and provide us the name of the person as well as the jurisdiction and cause number and the correct firm name for the person. We will ask eFileTexas to update that person's firm name for you and report back when it has been done.